We've reviewed several kinds of screen protectors, as well as some interesting pieces of glass that go over our smartphones, but it's so hard for new ones to stand out. One of them, the mPact Glass EXTREME Tempered Glass, manages to catch our attention because it's treated to be heat and pressure resistant – so that it won’t warp in warm temperatures. Naturally, it all sounds great, but how does it really stack up against some of the usual punishment we inadvertently put our devices through. With our particular review unit, we've installed it on an iPhone 6 Plus. Luckily, the application process is a breeze, since it includes a cleaning wipe, squeegee, microfiber cloth, and dust/dirt removal strips to cleanly install it. As soon as it's applied, the mPact Glass EXTREME Tempered Glass smoothly applies itself cleanly and evenly over the screen of the iPhone 6 Plus — though, a few pieces of dirt somehow got in. Now, it doesn't completely cover the entire surface of the front display, as it features chamfered edges to not only match the design aesthetic of the phone, but to also give some extra room for cases to fit around it. Sizing up at only 0.4mm, it's noticeably raised, but it gives it a fair amount of substance. Rounding things out, it features antibacterial properties and an oleophobic treatment to keep it clean looking and easily cleaned. Running over the bristles from a metal brush over the screen protector, it obviously safeguards the screen. However, as we used a sharper object, a pointy knife, we can vaguely see some scratch markings on the screen protector — albeit, there's still no damage to the iPhone's screen and they're only superficial. In addition, it's coated with a shatterproof film, so that shards won't go flying everywhere in the event it's dropped and shattered. Instead, everything is held together in place. This particular model for the iPhone 6 Plus retails for a whopping $34.99, which is rather pricey for a sturdier screen protector. 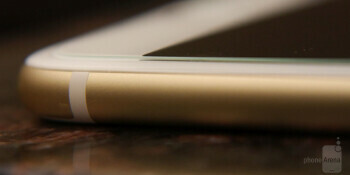 No doubt, we like its protective quality, but it's only protecting the screen — and nothing else. For the same price, you can pick up a ruggedized case with its own sort of built-in screen protector.